Birmingham, Midland Red and West Bromwich buses load up in our bus station on an event day. We are also home to the largest collection of battery electric road vehicles, including over 30 electric milk floats and bread vans from operators such as the Co-op, Midland Counties and Birmingham and Handsworth Dairies. We have event days each year, Easter Sunday/Monday, May Day Sunday/Monday, May Spring Bank Holiday Sunday/Monday, Fathers’ Day, August Bank Holiday Sunday/Monday and the 2nd Sunday in October. 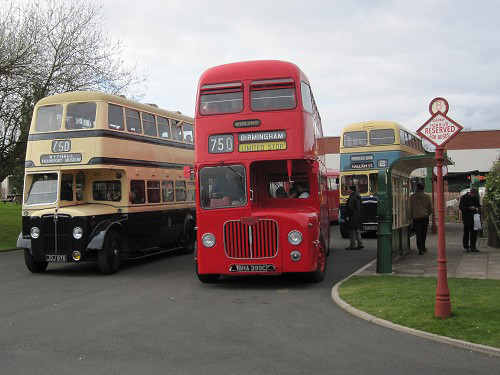 On these days you can ride on our classic buses plus the miniature steam railway. We also run a classic bus service at 1.00pm and 2.30pm on every Saturday and Wednesday during school holidays and half-terms (March - October). Visitors are advised to check through the website http://wythall.org.uk/ and the Facebook page for the most up to date details to avoid disappointment. pictured right: – One of our newest restorations, a 1940 Midland Red Single Decker. Your admission ticket can be upgraded to an “all day bus rides ticket” on Event Days at an additional charge of £5.00 adults; £2.50 children. Juniors Club (for 8-16 years) meets first Saturday of month from April to October. BY CAR - Wythall is on the A435 Birmingham to Evesham road, near to the junction with the M42. If approaching via the M42, leave at junction 3 and head towards Birmingham as far as the large island at Becketts Farm. Turn left and the Museum is signposted from there. BY PUBLIC TRANSPORT - On many event days our service 750 operates from Birmingham City Centre . The Museum is situated close to Wythall's old Church. In common with many other places, public transport services are frequently changing times, route numbers and operators. The 'Travel Search' website usually has a list of the current routes serving Wythall. Cars: Parking for 30 cars on site. Parking is free. Signed off-site parking will be necessary on major events such as August Bank Holiday. Event Days – all day!